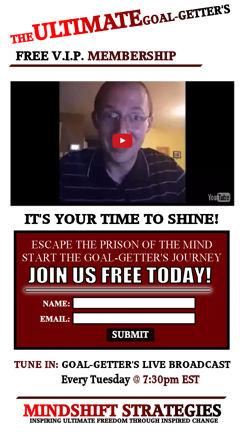 WELCOME TO THE ULTIMATE GOAL-GETTER'S BLOG! Do you remember having those dreams as a child that quickly turned into a nightmare, when you are suddenly being chased by a strange personage and you wake up in a sweat, thankful it was just a dream? Well... if you're chasing your dream, you may have become your dream's worst nightmare! You may have become that strange personage and your dream is hoping that one day it will wake up and realize it was just an illusion called a nightmare. ​The first one is when you are suddenly plunging to your perceived death from some tall platform. The second is the one mentioned above where we are being chased by a perceived strange personage or creature of some sort. The interesting observation I've made is that by being afraid of the first potential nightmare, which never was real in the first place, of falling flat on your face, we keep chasing our dreams instead of doing what actually works (which we'll cover in a sec) and as a result, our dream continues to flee from our grasp. Anytime we chase something or someone, the natural thing for the one being pursued to do, is to run the other way. So what do we do, if chasing our dreams only push them further away? The only way to reach a dream, a goal, or success in general is by using the natural laws that apply to human interaction and attraction. In the same ways that we attract friends, dates, and a spouse, we must use the same principles with everything we seek to attain in our lives - through attraction and commonalities! In daily human interactions, we typically will attract people that are like us in some or many ways. Who we currently are determines our friends and personal surroundings. Once in a while we may attract someone different than us, but chances are, these relationships will end up being passerby's, which will quickly fade or there will be constant friction. The same thing applies to your dream. If you are not already on common ground with your dream, your relationship with that dream will simply end up being a passerby, which will quickly fade or there will be constant friction. If you don't embody the qualities and characteristic that would be required to maintain your dream when you get there, you are not ready to attain it. When I'm around people who have already attained the dream I desire, do I enjoy their company or is it uncomfortable? When I think of living my dream right now, does it scare me or make me feel happy? When I see the work required to maintain the dream I desire in the lives of those that have what I want, can I see myself doing that everyday for the rest of my life? I have things to work on, but I absolutely LOVE the environment, the work, and the thought of living my dream! Write down the honest and open answers to the 3 questions and analyze your dream to ensure that you are going in the right direction. Once you've determined you are going in the right direction, you can then take action to develop The 5 Qualifying Qualities of a Goal-Getter embodied by ALL top performing Goal-Getters! Do you have a systematic and structured plan and support platform for developing the qualities you need to "make it"? If so, keep on trucking and come back to the Goal-Getter's Blog often for insights like these that will help shed years off of your learning curve. If you don't have a solid, systematic, structured plan for developing these crucial qualities, we've got you covered. Question: Do you even know what the 5 Qualifying Qualities embodied by ALL top performing Goal-Getters are? It would be hard to develop the qualities without knowing what they are, don't you think? Sweat no more! Remember, I said I had you covered. I'm literally going to GIVE you the special report that will reveal The 5 Qualifying Qualities of a Goal-Getter as a complimentary gift for taking the time to visit our blog today! Click Here For Instant Access Right Now! And once you know the 5 Qualities, I've also developed an effective and accessible system for developing and maintaining those qualities called The Ultimate Goal-Getter System, which is fun, exciting, and fulfilling! Go ahead! Download The Complimentary Report Now And I'll See You On The Inside! If you found value in this post in any way, be sure to share it with someone that you know could find value in it as well. If it was of benefit to you, you probably have at least one friend that would align with it as well.